Detail from the “Jumping Joan” illustration from Pocketful of Posies. As a former Facebook-phobic member of our modern society, I must admit that I “like” tending my page and hearing from people from all over the world. It’s been about 3 1/2 months since I became a part of this phenomenon and somehow (I still don’t understand how it all works) 1,000 people have found my Facebook page and clicked the “Like” button. Last fall, a group of Brazilians turned around my resistance to Facebook, when this blog’s statistics suddenly showed a huge surge coming from a Facebook post from Brazil that showed a photo of mine. 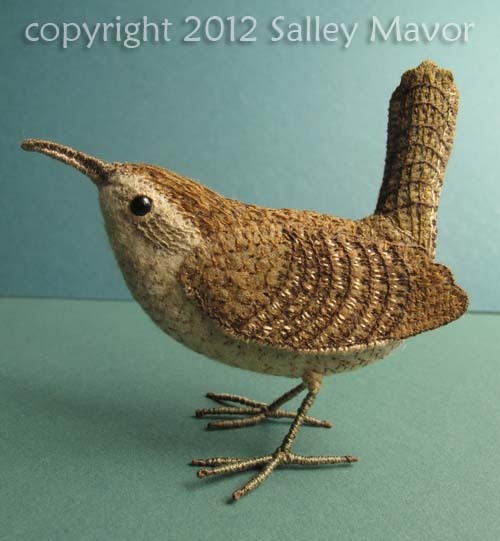 I found out that this little wren from Birds of Beebe Woods (pictured below) brought 5 thousand hits in one day! Now that I have a Facebook page of my own, the Brazilians are finding me again. When mile-long names like Angela Maria Izabel Ferreira Gonzalez Souza show up, I smile. Not to mention the Russians, Australians, Turks, and Canadians who frequent my page. Thank you for making my introduction to Facebook an enjoyable experience! This entry was posted in Uncategorized by Salley Mavor. Bookmark the permalink. It’s funny, Salley. When friends of mine moved from Canada to Mashpee last year, I remember thinking that must be near where you live! Not that I know you, or anything, but the internet does make it seem like the world is populated with friendly folks. Beautiful bird! Looks so realistic!!!!!!!!!!!!! Your work deserves to be admired everywhere. I am brazilian too, but live in USA. We are very art oriented. I’m just reading about the power of the internet and how the social networks may have such a force for some pretty amazing transformations, some good and some not so good. Here is one of those examples of the good it can do in bringing talent like yours to the fore, may there be many more like that. Well Salley, I still don’t want to go to facebook myself ! So happy that your amazing work is now getting the recognition it deserves, you make people happy! oh my goodness salley! congratulations…you could hold a class on how to get 1000 likes! that is, if you know…lol….! wonderful work would be my guess…well done you! Salley I found you with your book and your blog. I fight my friends and relatives that want me to join Facebook. Thank you very much for continuing your blog and your wonderful work. have a good one. Hey didn’t I see this little guy on my car this morning..leaving me a very unwanted present ..I might add.. Great Job Salley..so lifelike too! I’m glad FB has been so good to you. I use it, minimally, and don’t have a page (yet). Your little hummingbird is exquisite and reminds me of the hummingbirds who nested in my atrium once. Congratulations! 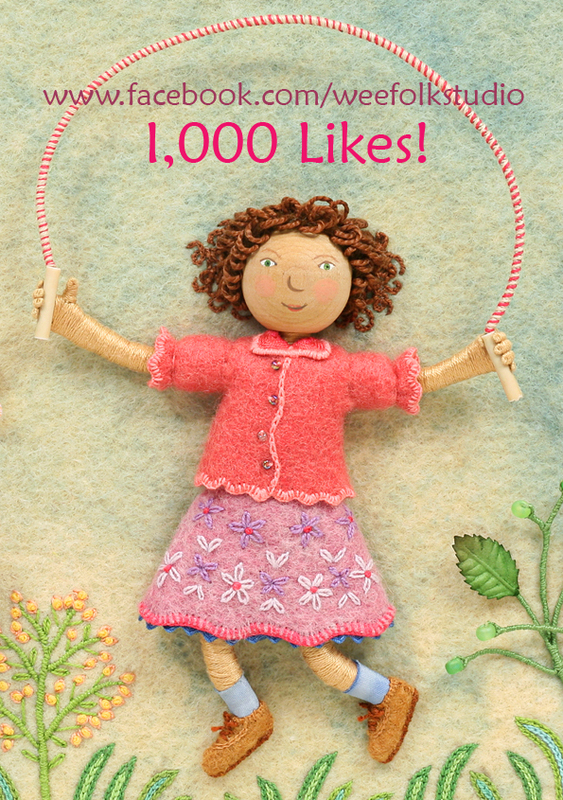 1000 Likes comes as no surprise to me – you are amazing! Isn’t this wonderful? Your work is just fabulous! Like you? Heavens yes, but in truth I LOVE you warmly, truly, deeply – and all you do, and share with us! I LOVE that you are on Facebook! The more Salley the better as far as I’m concerned. I love the other works you have been posting as well. That little wren is adorable. The cards with those birds turned out so well. Congratulations. Ever since I discovered you I made it a point to order my own personal copy of your book, “Pocketful of Posies, A Treasury of Nursery Rhymes”…and guess which character’s name I was always kidded about?